Hi. 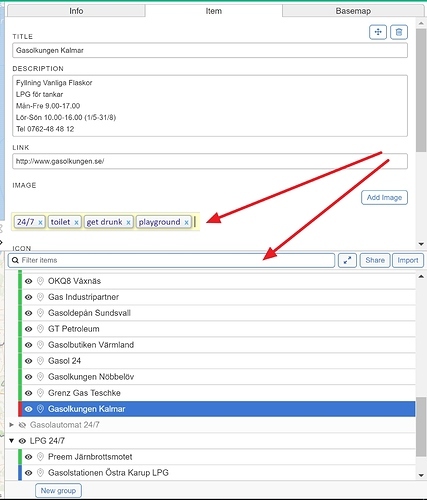 i have a question, is there any furure plans of implementing a system for tags or labels ? For a refined search through all all item in all created groups. You have a map with restaurants where you put them in separate groups, burgers in one group, pizza in another group, pasta, vegetarian and so on, every type in its own group. But then you may want to filter through all groups for places where the type of food is less important and other things could be more important at the moment. Like this: has the place a toilet, is it dog friendly, has it chairs for kids, playground, strong drinks, etc. I think some kind of system for tags or labels could be a really good thing.